As the manhunt continues for the second suspect, Boston remains more of a ghost town rather than bustling metropolis. Mass transit to and from Boston has come to a stand still on Friday as police conduct a massive manhunt for the remaining suspect in Monday’s Boston Marathon bombing with the exception of air travel through Logan International Airport. Authorities have indefinitely suspended mass transit taking to twitter to inform people to “Go/ stay home.” As the manhunt stretched into the afternoon, Amtrak stopped all trained between New York and Boston as well as intercity bus lines to the area. Passengers were allowed a refund or rebook for travel at a later date, while airline allowed customers to change plans without fees. In, Somerville, populations 75, 000, authorities told people to stay inside and lock their doors. The city went on lockdown Friday while the police continue their search for Dzhokhar Tsarnaev, the second suspect in the Boston Marathon bombing. Photos like the one above appeared online demonstrating the eery ghost town that is now Boston. The hunt for 19 year old Dzhokhar Tsarnaev piked up late Thursday night after the shooting at MIT, while the other Boston suspect identified as his 26 year old brother Tamerlan Tsarnaev died after a police shootout. Sean Collier, a 26 year old Massachusetts Institute of Technology police officer, was shot and killed on Thursday night during a confrontation with the two suspects. Officers responded to a disturbance when multiple shots were fired according to Middlesex Acting District Attorney Michael Pelgro and Cambridge Police Commissioner Robert Haas. Collier was taken to a hospital where he was pronounced dead. According to the Associated Press, the two suspects not only killed the officer, but injured a transit officer in a firefight and threw explosive devices at police during their getaway attempt in a long night of violence leaving one of the suspects dead and the other at large on Friday. The authorities classify the 19 year old as a dangerous terrorist and according to the Associated Press comes from the Russian region near Chechnya, a region plagued with Islamic insurgency stemming from separatist wars. On Friday at 3:15, according to eye witnesses, more than a dozen police cars were speeding to the UMass Dartmouth campus about an hour south of Boston adding to the strong police presences at the school where one suspect, Dzhokhar A. Tsarnaev, was a registered student. The authorities evacuated the campus Friday afternoon and announced the campus would be closed on Saturday after the manhunt for one of the suspects consumed the school. Students report seeing Tsarnaev on campus this week after Monday’s bombing as a result UMass Dartmouth announced the relocating of students to a nearby high school where transportation to and accommodations would be made. Our thoughts and condolences continue to be with the victims of the Boston Marathon attacks. We are grateful to the brave first responders and law enforcement officers, who endangered their own lives in pursuit of the suspects and to keep the people of Boston safe.This is a time for us to come together as Americans during a sad and difficult moment. As information continues to emerge, we urge the media and the public to refrain from scapegoating or turning against our fellow Americans based on their racial, ethnic, religious or immigrant identity. Incidences of violence against such groups has already occurred with a Muslim woman being attacked in the Boston area on Wednesday. The woman wearing a hijab was attacked by a man shouting that Muslims had perpetrated the twin bombing killing three people and wounding 170 Monday. Heba Abolaban, a Palestinian doctor who came to the United States from Syria, said she was punched in the shoulder in Malden, Mass. by a man who shouted “F*** you Muslims!” and “You are involved in the Boston explosions” according to the Malden Patch. The man a white male in his 30s shouted at the woman for two minutes before leaving the Patch reports. Polis Cheif Kevin Molis stated to the Boston Globe that, “No investigative strategy will be overlooked in order to determine who’s responsible for this. This is something that as a city and as a police department we take seriously.” While conservative commentators, like Glenn Beck, speculate Monday’s attack was perpetrated by Middle Easterners, the nationalities of the marathon bombers were still not know as of Thursday afternoon. However, the FBI on Thursday released photos of the suspects and enlisted the public’s help to track them down leading us to the manhunt in progress now. 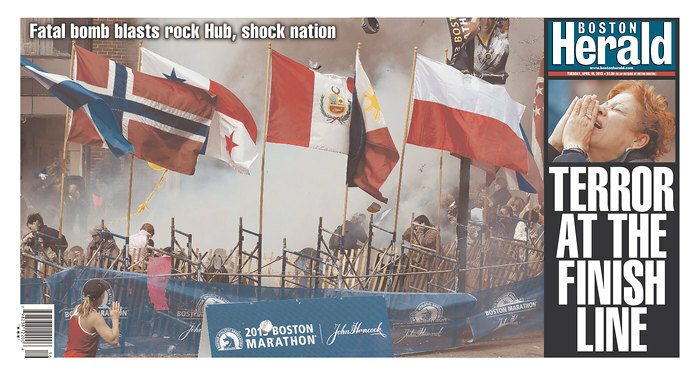 Boston Marathon Blast Rocks City, State and Country to Its Core. 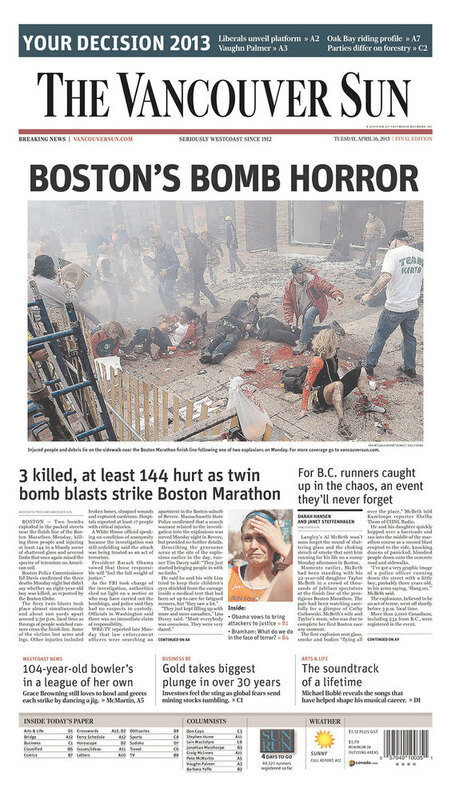 Front pages from across the globe and photos/stories of the victims. As a huge billboard towers over the city of Boston reading just one word…COWARDS, the victims of Boston Marathon blast and the entire city tries to deal with the questions why and who after Monday’s tragedy. Not since 9/11, has there been such an attack on American soil by terrorists or alleged terrorists. Security questions, the who and the why, have always been in the back of American’s mind since 9/11 and now resurface as the volatile climate escalates around the world. As Americans, we are not immune nor removed from the problems around the world. My heart goes out to the city of Boston especially those present that fateful Monday, victims and families included, when lives were lost and changed forever. This country has always been resilient in the face of tragedy not because of government but because the strong will of everyday people who decide to with risk to themselves to help others. It is in those precious moments where we realize humanity has been restored. As the world remains dumb founded by the tragedy, the FBI, local police department, and White House begin to piece together Monday’s events with no clear suspect as of yet. An Atlanta news stations obtained the first close up of one of the two bomb’s that went off in Monday’s blast which killed three and injured 180 people. Crime photos posted by Fox 5 Atlanta show the mangled pressure cooker used to make a homemade explosive device. This type of bomb is more commonly used in Afghanistan, Pakistan, India and Nepal, however was used in a domestic terror attacks and attempted bombing in Time Square in 2010. Doctors are treating the wounded at local hospitals finding some victims had BB pellets and nails lodged in their bodies leading authorities to believe that these items were placed inside the pressure cooker with the bomb itself. 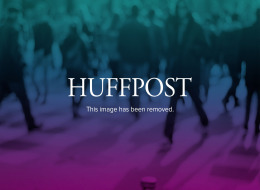 The FBI would not comment on the picture according to Huff Post. Authorities have recovered a piece of a circuit board believe to be a part of the explosive device and found the lid of the pressure cooker on a roof of a nearby building officials reported Wednesday. According to the Associated Press, law enforcement officials briefed on the investigation confirmed the recovery of some parts of the explosive devices, but were not authorized to publicly discuss evidence in an ongoing investigation. The person close to the investigation told AP the bomb was made up explosives in a 1.6 gallon pressure cooker with shards of metal and ball bearings,while the second bomb had nails placed with the explosives. Investigators in white jumpsuits searched the streets, rooftops and awning around the blast site in hope of finding clues Wednesday. They combed debris , trash cans and sleeves of plastic cups at the marathon’s finish line. Doctors at Boston Medical Center on Wednesday said two patients are in critical condition and dozens are being released from hospitals around Boston. Law enforcement agencies on Tuesday asked publicly for people with photos, videos or any other information to come forward in order to help solve the twin bombing. Investigators spread information about the bomb and have yet to find information on who may be responsible. 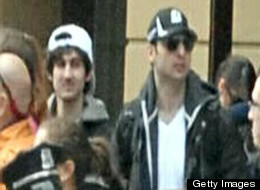 Richard DesLauriers, FBI agent in charge in Boston, said in a news conference that,”Someone knows who did this. Importantly, the person who did this is someone’s friend, neighbor, co-worker or relative.” President Obama publicly called this an act of terror and will attend services on Thursday for the victims’ of the tragedy in Boston. Sequester Could Put Gun Background Checks At Risk, Officials Warn. Today, I am going to talk about two related topics…gun control and gun violence since we are still talking about an issue that really doesn’t have a grey area but the government and pro second amendment supporters believe does. If the sequester happens, a direct effect of it will be background checks for people wanting to buy guns. It will actually cause more problems like the one that happened this morning in Las Vegas, where it started with a shoot out at a stoplight, then a car crash, and finally like a scene out of our favorite action movie an explosion of a cab that ended with three people dead and many injured. I cannot make this stuff up people this really did happen. Police believe it began in a hotel with an altercation that ended with six vehicles involved in the crash with the potential culprit of the explosion a propane powered taxi. This country, since the Newtown shooting that left many dead and many more questioning why no one has stepped in to alleviate the latest string of deadly violence across nations, has marred this country and raised the concern about gun laws and gun control. The worse part is yet to come if the sequester happens on March 1 according to government officials. With no hope of a deal to avoid sequestration, the looming automatic spending cuts may become a reality leaving many Americans to brace for the worse. If Congress and the president cannot come to a solution about the $85 billion across the board spending cuts that take effect March 1 then the federal background check system for approving gun buyers could face cuts according to a letter FBI officials sent to lawmakers earlier this month. FBI director in a letter told the Senate Appropriations Committee chairwoman Barbara Mikulski (D-Md.) that the spending cuts would cause the agency to furlough more than 2,000 workers which would greatly effects the bureau’s ability to process and adjudicate NICS requests increasing the risk of firearms being transferred to convicted felons and other prohibited persons. In a speech Tuesday, Obama urged Congress to pass a plan that combines spending cuts and tax increases on the wealthy to avoid sequester however the Republicans refuse to raise taxes. And the Republicans wonder why their approval rating is so low…maybe because they don’t really care about 99% of the population who happen to put them into office. Hey I am not a big fan of Democrats or Republicans because let’s face it both parties have made mistakes, but the Republicans are not helping their own cause by protecting the wealthy of this country. The demand for guns came soon after the Newtown shooting causing background checks for gun purchases to jump to record levels in December according to the FBI. In correlation with the rise in background checks, many gun owners cannot meet the demand of guns causing many to sell out of guns and ammunition. The gun background check is one of many programs that will be hit hard by the sequester if it does happen on March 1. The Agriculture Secretary Tom Vilsack has said his agency would be force to furlough nearly one third of its workers that would cause the meat industry to shut down for up to two weeks for lack of inspectors. Looking at the much larger picture, the sequester could cost the U.S. economy 750,000 jobs by some estimates and up to 1 million jobs by others. What is the government doing? Nothing. Will they do something? I hope so and I hope soon before we all crash and burn due to the inability of the government to act for the people not for themselves. I hope they prove me wrong. Orange County Shooting Spree: Several People Dead After 25-Minute Ordeal, Police In California Say. As the debate over gun control heats up between second amendment protectors and gun control supporters, another shooting has happened in California just days after a young girl was shot after attending Obama’s speech about gun violence in Chicago. Is there really a debate when it comes to protecting the people who live in any country? Compromises will have to be made in order to fix the growing gun violence problem which is only one of several problems the government needs to fix. Whether in favor of gun control or not, these shootings should be few to non existent with the appropriate gun measure put into place. A woman in Tustin, California just 35 miles southeast of downtown Los Angeles, was shot to death in her home Tuesday by a young man who then went on a carjacking shooting spree across Orange Country killing two more people and wounding three others before killing himself. According to Tustin Lt. Paul Garaven, many were shot out but no one was hurt. The motives of the shooter were unknown and could only be described as in his 20s. The connection between the victims and shooter are unclear at this time said Orange County sheriff’s spokesman Jim Amormino. The shooting happened at 4:45 a.m. when a call came in about a woman shot multiple times in a house in Ladera Ranch about 55 miles southeast of Los Angeles. Several shootings occurred over the next hour at other locations including a carjacking on interstate 5 which left the carjacking victim uninjured and left an innocent bystander shot and taken to the hospital. The gunman also fired at several other vehicles on the freeway. The gunman soon ran out of gas in the pick up truck he carjacked, so he then stopped on Route 55 and McFadden Avenue in Santa Ana and executed another victim before taking the man’s BMW. The shooter then drove to a Tustin business and carjacked a utility type pickup after wounding one person and killing another. When officers tried to stop him in the city of Orange he got out of the vehicle and killed himself. The southbound 55 McFadden Avenue off ramp was closed til further notice. Chad Littlefield’s Family Defends Fatal Gun Range Outing. Sad that when someone tries to do good something bad happens. We can all learn something from this. On Friday, in Midlothian, Texas the relatives of the man killed alongside a former Navy SEAL sniper at a Texas shooting range said that he was trying to help his friend who was a troubled war veteran and the outing was for “therapeutic purposes.” Hundreds turned out for Chad Littlefield’s service who was fatally shot alongside his friend American Sniper author Chris Kyle. The Authorities have confirmed that the man the two men were trying to help suffered from post traumatic stress disorder. Littlefield’s father-in-law defends the idea of helping veterans through target practice as his son-in-law would assist Kyle in his efforts to help veterans. Police say the suspect 25 year old Eddie Ray Routh shot both men multiple times before fleeing on Feb. 2 and even told his sister as well as brother-in-law he couldn’t trust the men so he had to kill them before they killed him. Routh is in jail on a $3 million bond. Besides the hundreds who turned out for the funeral, hundreds of people lined the street to watch the procession pass. Both men became friends a few years ago as soccer dads and their families vacationed together on occasion. A memorial for Kyle is set for Monday at Cowboys Stadium in Arlington.